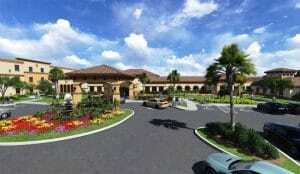 The facility located in Fort Myers, Florida, will offer 134 units for assisted living and memory care. Fort Myers, Florida – October 2016 – Gilbane Building Company and Omega Communities along with the project team and local community, came together to celebrate the official ground breaking of the senior living community located in Fort Myers, Florida. The project will bring 134 units to the market. 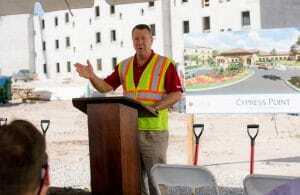 96 of the unit will be assisted living offering 102 beds as well as 38 memory care units. The 105,000-square-foot building, located on a five-acre site, includes new construction of three structures which are connected by corridors. A three-story structure will house the assisted living and the memory care wing will be located in a single-story building featuring private rooms. The third building will contain administrative offices for staff and activities area, library dining rooms and kitchen for residents. The project, designed by the Lawson Group, Inc., is a combination of Mediterranean style with Spanish concrete tile. It is located at the intersection of Daniels Parkway and Six Mile Cypress Parkway in Fort Myers, adjacent to the Minnesota Training facility and Gulf Coast Hospital. Gilbane Building Company has extensive experience in the construction of senior living and skilled nursing facilities having completed more than $300 million throughout Florida in the past 20 years. They most recently completed The Springs of South Biscayne Senior Living Facility. Gilbane also brings more than 30 years of working with the Agency for Health Care Administration (AHCA). Tim Hensey, vice president, Gilbane Building Company addresses crowd at groundbreaking. Gilbane provides a full slate of construction and facilities-related services – from pre-construction planning and integrated consulting capabilities to comprehensive construction management, close-out and facility management services – for clients across various markets. Founded in 1873 and still a privately held, family-owned company, Gilbane has more than 50 office locations around the world. A builder in Florida since 1972, Gilbane has remained a leader in the delivery of comprehensive pre-construction services, construction services and construction administration. For more information, visit www.gilbaneco.com.